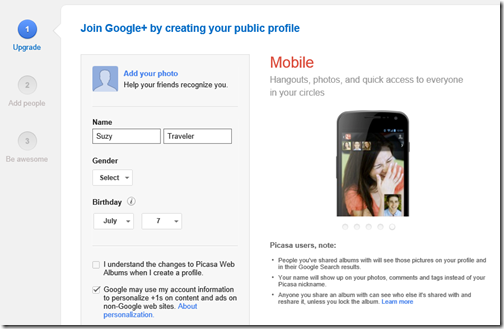 Picasa Tip: Are You Using Google+ Yet? – Learn Picasa and Google Photos! Is there a way to share multiple existing albums (I have hundreds) with my “circle” without clicking on the “share” button on each album. I am looking for a global setting to share all my photos with my circle with one or two clicks. Seems simple enough… but if I remember correctly, on picasa online albums, if I organize a folder on my computer, they organize the same way on the online folder. Now I seem to have to organize them on my desktop and then organize them again online. Doesn’t sync really sync? I don’t want Google Plus. I don’t want Google Circles. I deplore the way Google has ripped Picasa Web Albums out of my Google Account online options in its continuing attempt to find out everything it can about everybody everywhere so as to profile them for advertising — oh, and vanquish Facebook in the process. There are millions of morons in the world who have neither the ability to value their anonymity nor any capacity for self-esteem. Equally, however, there are millions more intelligent enough to know that if they wish to “share” and if they wish to “like” and if they wish to have a “circle” of friends, then they’ll do so without their lives being managed by a giant faceless corporation which — as Google has shown in its ripping-out of Picasa from gmail accounts — is just Orwell 1984 by another, and quite silly, name. The assinine gibberish posted on here about how wonderful it is to have Google Plus, and Circles, and all the rest of the predictable sales nonsense convinces no-one. If Google wants the details of who I am, what I want, and what and who I like it’ll have to come up with a checkbook. Not Google Plus — and definitely not, its blatant attempt to mass manipulate a mass audience in order to derive mass profits from it. Picasa Web Albums was wonderful. RIP, Picasa. Thanks for the article on google +. So I see the difference between PWA and G+ however how about the rest of Picassa. 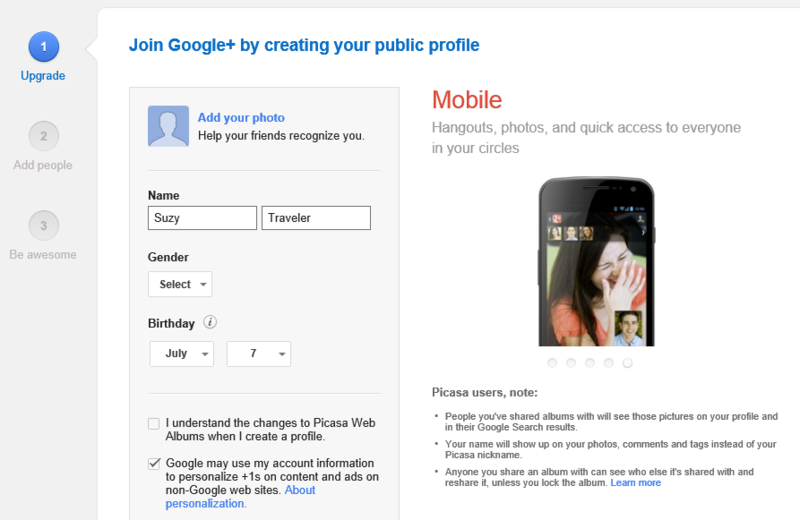 I have basically steered away from google plus since I saw it as a way for them to do social media. However are they replacing Picassa? Or does it continue on my computer as a way to catalog and manipulate images? Are there features of G+ that over time replace the Picassa on my desktop if I want that? I can see your point about googles efforts going forward will be in G+ and not the old stuff. Do you see them deleteing any more functions from existing Picassa? I don’t have any inside information on Google’s plans. I see no reason for them to eliminate Picasa3 on your computer though – it is the best way to get pictures up to the Google+ Photos. Yes, Picasa continues on your computer as a way to catalog and manipulate images on your computer – no Internet connection involved. I have one question, after the pictures are uploaded to Google+, if the source file is deleted are they gone from Google+ as welll?? I think by ‘source file’ you are referring to the picture on your computer? 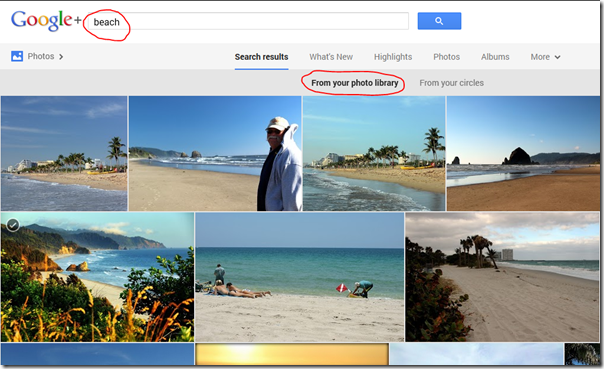 Then, NO, if you delete the file on your computer, the picture still exists on the Google+ Web album. UNLESS, you chose the synchronize option in Picasa. Just Uploading a picture from your computer to the web definitely does not delete the picture on your computer.